Hideo Kojima has announced a new initiative called transfarring that'll let players game everywhere. At the Konami pre-E3 2011 press conference, Hideo Kojima revealed an interesting new concoction he calls "transfarring." No, that's not a typo. While the basic idea refers to transferring game saves between consoles and handhelds, the announcement points toward a greater intention of Kojima's to incorporate the concept into most of his games. Which means, of course, that he'll eventually have to create both portable and console versions of these games. To start, transfarring will be included with the releases of the just-announced Metal Gear Solid HD Collection and Zone of the Enders HD Collection. Both are coming to the Xbox 360 and the PlayStation 3, but owners of Sony consoles will be able to take advantage of transfarring. Metal Gear Solid HD Collection will include the PS2's Metal Gear Solid 2, Metal Gear Solid 3, and the PSP's Metal Gear Solid: Peace Walker. Zone of the Enders HD Collection will include the PS2's Zone of the Enders and Zone of the Enders: The 2nd Runner. Konami says the versions appearing in these collections are rebuilt for the Xbox 360 and PS3 with new interfaces, redrawn high-res art, effects, and fonts, new trophies/achievements, and improved audio. 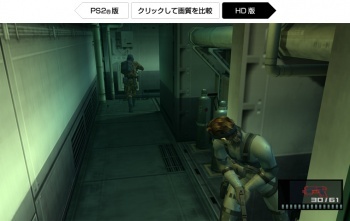 In Peace Walker, players will be able to connect a USB cable between PS3 and PSP to "transfar" game saves back and forth easily. Konami didn't seem to reveal how any of the other titles would support transfarring, but clearly put the transfarring mark on the Zone of the Enders HD Collection box. Kojima says PS3 to PSP game saves are step 1 of transfarring. Step 2 is using it with PS2 games on PS3 between the PS3 and PSP. Step 3 involves moving data between the PS3 and Sony's next-gen NGP handheld. So there you have it, a complicated name for a relatively simple feature. Metal Gear Solid HD Collection is scheduled for release in November 2011, while Zone of the Enders HD Collection will be available in 2012. Are you ready to transfar?